[Charles Williams, poet and author (the Inklings), to the playwright Christopher Fry.] Autograph Letter Signed, Typed Letter Signed and Typed Card Signed (all 'C. W.'), in copy of his 'Thomas Cranmer of Canterbury', with Fry's ownership signature. Autograph Letter from Southfield House, 1941. Typed Letter, 1942, and Typed Card, 1944, both on Oxford University Press letterheads. The letters are in fair condition, lightly aged; the card is discoloured and stained. Loosely inserted in a copy of Williams's 'Thomas Cranmer of Canterbury', 75 + pp, 8vo, with the ownership signature 'Christopher Fry' on the front free endpaper, in worn binding with fraying at head of spine. Delightful and revealing letters, mixing personal and business (Williams worked for the Oxford University Press and Fry was published by them). ONE: ALS from Southfield House, 17 December 1941. 2pp, 12mo. Thirty lines of closely-written text, on a leaf of ruled paper torn from a notebook. 115pp, 12mo. In good condition: sound and tight, on browning War Economy paper, in green cloth with slight bloom, and in slightly worn and chipped browning dustwrapper. (The subtitle 'A Play in Three Acts' features on the dustwrapper, but not on the title-page.) Fry's ownership inscription 'Christopher Fry' is in blue ink at the top right-hand corner of the recto of the front free endpaper. A verse drama from the library of the leading twentieth-century English exponent of the genre, after T. S. Eliot. [Christopher Fry ownership inscription to a book by Charles Williams.] The Region of the Summer Stars. 55pp, 8vo. In fair condition, internally tight and sound, on browning paper, in lightly-worn blue cloth binding. No dustwrapper. Slight dink at head of spine. Ownership inscription 'Christopher Fry' in blue ink at top right-hand corner of recto of front free endpaper. Fry and Williams were on cordial terms, the latter working for Oxford University Press and the former being published by them. [ Poetry of the Victorian Raj. ] Printed leaflet . Poem titled 'A Member of Council's Farewell to Simla'. 2pp., 4to. On the first leaf of a bifolium. In fair condition, lightly aged, with the first page carrying some minor offsetting of black ink from a letter, and the recto of the blank second leaf bearing traces of mount. A poem of 52 lines, arranged in 13 quatrains. A gently humorous valediction. The first stanza reads: 'Farewell to thee, Simla! Yes, farewell for ever! [ Frank Eyton, lyricist. ] Autograph Note Signed ('Frank Eyton') accompanying his typed original humorous poem about road works 'A Finchley Road Cameo'; together with a Typed Letter Signed ('Frank') of reminiscences and family news. Typed Letter Signed on letterhead of The Montecito, Hollywood, California, 20 September 1937. Autograph Note with Typed Poem on his letterhead, 12 Lowther Mansions, Barnes, S.W.13 [ London ]. 24 December 1937. Both items in fair condition, lightly aged and worn. ONE: Typed Poem followed by Autograph Note Signed. 24 December 1937. 2pp., 8vo. The poem consists of eleven four-line stanzas, with the title typed in red. An apparently unpublished humorous poem, quite charming and well worthy of publication. Begins: 'For months we've had electric road-drills | Right outside our door, | And two gentlemen who play them | Called in yesterday at four. Harry Graham [Jocelyn Henry Clive 'Harry' Graham (1874–1936)], writer, poet, humourist, journalist, soldier, traveller, " inventor of ruthless rhymes". leaves (rectos numbered only), 4to, stiff boards, good condition, typescript, annotated by the author, additions, corrections, excisions, who has inscribed the recto of the free endpaper "Harry Graham. || Royal Court. | Palace of Westminster. | London, S.W. | England". The scene is set in Charlotte Corday's prison cell, and the dramatis personae listed are Charlotte herself; Francois Chabot (Deputy for the Departement of Loir-et-Cher; Jean-Jacques Hauer, A Young Artist; Richard, Warder at the Conciergerie Prison; Charles-Henry Sanson, Public Executioner. [ Edward Lear, artist and writer of nonsense verse. ] Autograph Signature ('Edwd Lear.'). On 2 x 6cm strip of paper, cut from a letter. In good condition, lightly aged. A good firm signature, underlined, with the tiniest part of the head of the loop of the iniitial 'E' of 'Edwd' has been shaved off. [ Horace Mills, humorous poet, on First World War Zeppelins. ] Autograph Letter Signed accompanying a printed handbill poem titled 'Disturbed', describing how his peaceful pipe-smoking was disturbed by the 'Zepps'. Letter from Gunton Cottage, Bennett Park, Blackheath, S.E. [ London ] 26 November 1916. Handbill poem without date or place. Both letter and poem are in good condition, on lightly-aged paper, with a little rust spotting on each from the paperclip that attached them. ONE: Autograph Letter Signed to unnamed lady. 1p., 12mo. He thanks her for liking his 'humble verses', and invites her to drop him a line 're their fate'. TWO: Handbill poem, printed on one side of a 12mo piece of grey paper. Titled 'DISTURBED' and signed in type at end 'HORACE MILLS'. The poem is twenty lines long, and arranged in five four-line stanzas. [Pamphlet; Queen Victoria] The Best and Greatest Quenn. [...] A Trilogy. Pamphlet, pp., inc. printed wraps, closed tear, back wrap, otherwise good condition. Verse celebrating the Life and Death of Queen Victoria. No copy found on COPAC or WoerldCat. [First World War poetry pamphlet in French.] 1914 1918 Nos Angoisses par J. Droit. [S. LEDOUX, Imprimeur-Editeur, Avenue des Viaducs, 39. CHARLEROI'. 24pp., 12mo. Stapled. Lacking title-leaf (publication details quoted from another copy) and with damage to last leaf, on aged and lightly-creased cheap paper stock. Ten poems, five of them dated: 'Aux Affamés' (8 January 1917), 'Le Bon Fermier' (15 January 1917), 'Le Crime', La Grève Judiciaire' (September 1918), 'Le Retour du Soldat' (10 October 1918), 'Les Pauvres Gens sont comme les Pavés', 'Assez! ', 'L'Abdication' (15 October 1918, regarding the Kaiser's abdication), 'Ce que demande le Peuple! ', 'La Plainte du Soldat'. The item featured in the 1919 'Belgische Bibliografie'. [Alfred Noyes, English poet.] Autograph Card Signed to 'Miss Meugens', granting permission to make a version for the blind of his 'Torch-Bearers'. Bound in off-white paper over boards; white cloth shelfback, 98pp., sm.8vo, good condition. Printed title stuck on front cover, 4 x 1cm, inscribed "Roderick from Pat || 15th March 1938." Scarce. [Printed pamphlet.] Poems from the Diary of a V. A. D. By Carrie Portelly. Printed by Edwin Trim & Co. Ltd. Wimbledon S.W.19. Undated, but individual poems dated between September 1938 and October 1942. + 38pp., 12mo. Stapled into brown printed wraps, with the title and printer's slug on the cover, which also carries the price of two shillings and sixpence. In good condition, on lightly-aged paper. Introductory note reads: 'These few pages refer to war-time troubles at home and in hospital, and other people's love laments. C.P.' Unpretentious poetry, giving an insight into the work of a V.A.D. 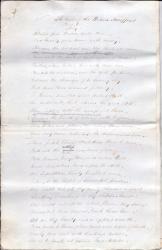 Holograph poem by John S. Broad of Newcastle-under-Lyme, titled 'Forbearing Love' ('Heap coals of fire upon the guilty head'), with covering Autograph Letter Signed ('John S Broad'), expressing the hope that the poem will 'answer your purpose'. Poem from Newcastle-under-Lyme, undated. Letter from Newcastle, 26 December 1843. Both items in good condition, on lightly-aged paper. Poem: 1p., 4to. Titled at head: 'Forbearing Love | Romans XII 19-21.' Signed at foot: 'John S. Broad | Newcastle under Lyme'. The poem consists of 24 lines in six four-line stanzas. The first stanza reads: 'Heap coals of fire upon the guilty head, | And melt its malice down; | Let flames of love around it be outspread | And charm away its frown.' The last stanza: 'Thus shall it win its conquering way in peace, | Raise trophies free from blood; | Thus make the storms of sinful passion cease | And bow the heart to God!' Letter: 1p., 12mo. Nine Autograph Letters Signed from the poet Herbert Palmer to Rev. Harry Escott of Rhynie, Aberdeenshire, editing a book of Escott's poetry, discussing Christian verse, and attacking T. S. Eliot, the Faber poets and modernism. All from 22 Batchwood View, St Albans, Hertfordshire. One from 1938, two from 1942, one from 1943, and the rest undated. Totalling 36pp., 4to. In fair condition, bound by Escott with brown paper into paper wraps, with the front wrap signed by Escott and bearing the typed label 'LETTERS from HERBERT PALMER on "Minstrels of Christ" and my second book of verse "Soar for Victory", amended in February 1948 to "Back to the Fountain."' An interesting correspondence, casting light on the workings of the mid-twentieth century publishing industry, from the point of view of a successful traditional poet strongly opposed to modernism. Anonymous abolitionist poem, in a mid-nineteenth-century hand, entitled 'The Fugitive Slave', with the first line: 'I'm weary yet I cannot sleep'. Apparently unpublished. 3pp., 12mo. Bifolium, on ruled, laid paper. Fair: aged, with a 12.5 x 5 cm section cut away from the top of the first leaf, before the writing out of the poem. 63 lines, divided into six nine-line stanzas. The stanzas are numbered, and the poem is complete. The stanzas are numbered, and the poem is complete. [Handbill] Untitled Verse about a meeting of Welshmen in London c.1879. Long manuscript of an early Victorian poem entitled 'The last of the Hohen Stauffens', divided into three sections: 'Italy', 'The Morning of the Execution' and 'The Execution'. With a number of emendations and deletions. Undated, but on paper watermarked 1841, and docketed 'Written for Dublin about 1843'. Folio, 11 pp. On the rectos of eleven leaves of Britannia paper watermarked 'W H FELLOWS | 1841'. Held together with string. Text clear and complete. In ink, with deletions and emendations in pencil. Good, on aged paper. Docketed on reverse of last leaf. The subject of the poem is the execution of Conradine in the market square in Naples, 29 October 1268. The first section (3 pp) begins 'Italia fair Italia unto thee, | Was beauty given twice with misery, | At once the loveliest and the loveliest clime, | Thou wert the seat of Empire, and of crime; [...]'. "The true hero" and other poems. 64 pages, 16mo. In original printed wraps. In poor condition. Ownership inscription at head of front wrap. The two binding staples rusted, and the wraps in particular grubby, torn and worn. Photograph of 'Private JENKIN THOMAS' in what appears to be World War I uniform on front wrap. Illustration of the 'SINKING OF THE "TITANIC." ' on page 9; photograph of 'WILLIAM HERBERT HARRIS, A.L.C.M.' on page 47. 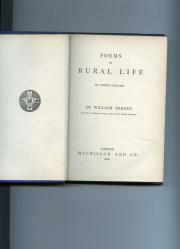 Poems of Rural Life in Common English. First edition. 8vo: xii + 200 + [iv] pp. (the last four pages an unpaginated publisher's catalogue). In original blue cloth, gilt. Fair, tight copy, on lightly-aged paper, with some spotting to endpapers. Binding with dulled spine and minor spotting. Bookplate of the Rev. English Crooks. Binders ticket ('BOUND BY BURN & CO.') to rear pastedown. Half-title reads 'RURAL POEMS'. 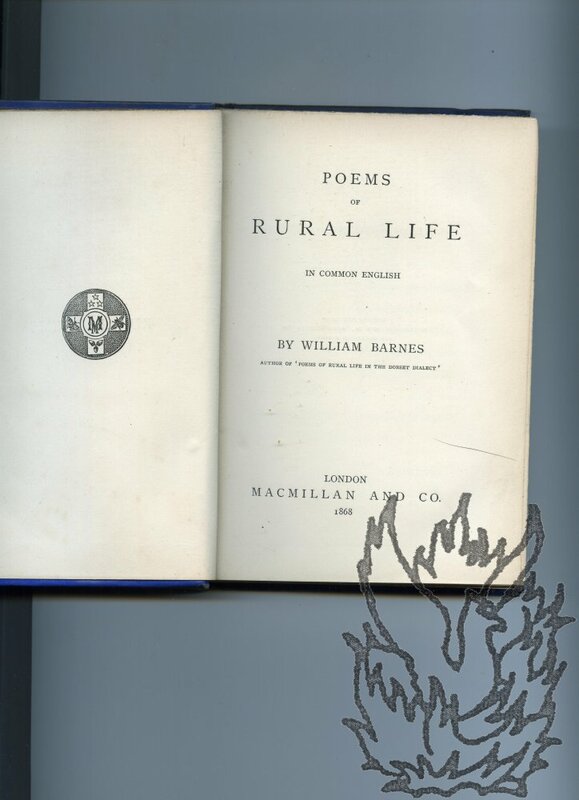 The 'translation' of the three collections beginning with 'Poems of Rural Life in the Dorset Dialect' (1844). Everything New? Or Nothing New? A Satirical Comicality, Relating to Men, Manners, Incidents, and Novelties of the Day. [...] To which is added, The Shakespeare Tercentenary Prologue, As Spoken by the author, April 23, 1864. 12mo: 24 pp. In original pink printed wraps: the front wrap bearing the title; the recto and verso of the rear carrying newspaper reviews of works by 'Scribble'. Stitched. On aged and spotted paper. Wraps heavily worn. A worn presentation inscription can be made out at the head of the title: 'Dr <?> With the Authors Best regards'. Pp.1-2: Introduction and Author's Preface (the latter dated 'Dublin, May, 1864.'). 72 Kirkgate, Cockermouth; 8 August 1931. Small 8vo. Pages: viii + 24 + [4 blanks]. Original cream paper wraps: title and price in red and engraving in green on front. Wraps discoloured, rubbed and stained, with covers loosening and loss at foot of spine. Internally sound and tight, but quite heavily foxed. Dated ownership inscription on flyleaf. Titlepage vignette and 15 engravings. Collection of whimsical poems about places like Hampstead Garden Suburb and people like G. K. Chesterton and Bernard Shaw. Taylor & Sewell A125b.